Hormones are not secreted at a uniform rate and exert their effect at low concentrations. D.5 U 1 ​Endocrine glands secrete hormones directly into the bloodstream. The endocrine system uses chemical signals to communicate and regulate the body’s physiology. The system releases hormones that act on target cells to regulate development, growth, energy metabolism, reproduction, and many behaviors. Endocrine glands contain no ducts; they release their secretions directly into the intercellular fluid or into the blood. The collection of these glands makes up the endocrine system. 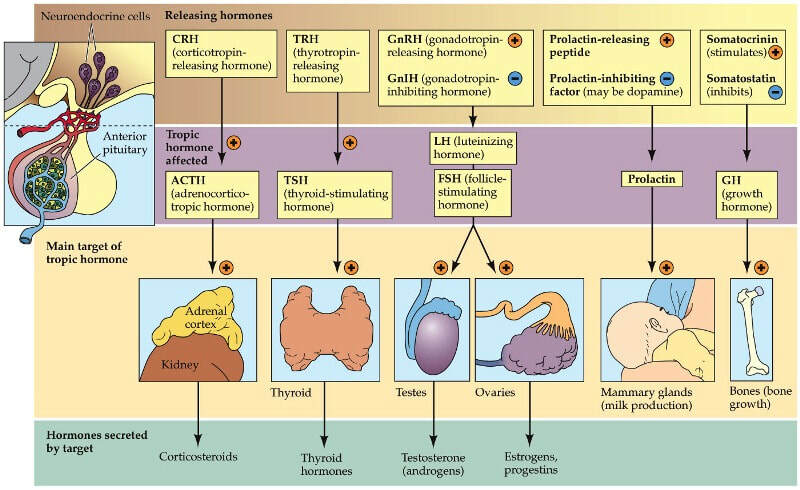 The main endocrine glands, which we will learn about in this section and in the following ones, are the pituitary (anterior and posterior), thyroid, parathyroid, adrenal (cortex and medulla), pancreas, and gonads. D.5 U 2 ​Steroid hormones bind to receptor proteins in the cytoplasm of the target cell to form a receptor–hormone complex. Steroid hormones are made from cholesterol and have a characteristic pattern of carbon based rings that you need to be able to recognize - NOT draw. They are hydrophobic and so can cross membranes. (Note that the plasma protein, albumin, transports steroid hormones in blood plasma). These include the plasma membrane and the nuclear membrane. Once inside the cell it binds to a receptor in the cytoplasm and the complex (of hormone and receptor) crosses the nuclear membrane. The hormone receptor complex directly influences the transcription of genes as it binds to a region in front of the gene called a promoter region. This can promote or inhibit the transcription of the DNA and hence production of the gene product . The hormone receptor complex acts as a transcription factor regulating gene expression. Examples include Testosterone, Oestrogen, Progesterone. 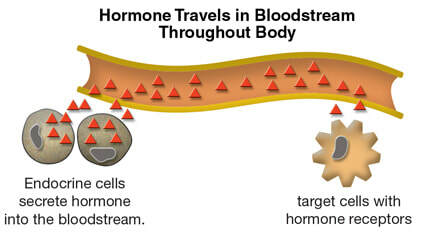 ​Steroid hormones cause changes within a cell by first passing through the cell membrane of the target cell. Steroid hormones, unlike non-steroid hormones, can do this because they are fat-soluble. Cell membranes are composed of a phospholipid bilayer which prevents fat-insoluble molecules from diffusing into the cell. Once inside the cell the steroid hormone binds with a specific receptor found only in the cytoplasm of the target cell. The receptor bound steroid hormone then travels into the nucleus and binds to another specific receptor on the chromatin. Once bound to the chromatin, this steroid hormone-receptor complex calls for the production of specific RNA molecules called messenger RNA (mRNA) by a process called transcription. The mRNA molecules are then modified and transported to the cytoplasm. The mRNA molecules code for the production of proteins through a process called translation. D.5 U 4 ​Peptide hormones bind to receptors in the plasma membrane of the target cell. D.5 U 5 ​Binding of hormones to membrane receptors activates a cascade mediated by a second messenger inside the cell. 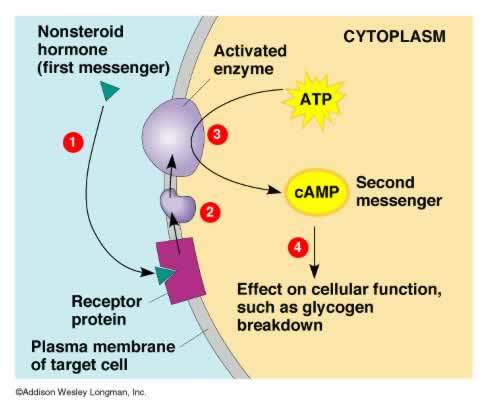 Second messengers are molecules that relay signals received at receptors on the cell surface — such as the arrival of protein hormones, growth factors, etc. — to target molecules in the cytosol and/or nucleus. But in addition to their job as relay molecules, second messengers serve to greatly amplify the strength of the signal. Binding of a ligand to a single receptor at the cell surface may end up causing massive changes in the biochemical activities within the cell. D.5 U 6 ​The hypothalamus controls hormone secretion by the anterior and posterior lobes of the pituitary gland. D.5 U 7 ​Hormones secreted by the pituitary control growth, developmental changes, reproduction and homeostasis. D.5 A 1 ​Some athletes take growth hormones to build muscles. Growth hormone is a peptide hormone produced by cells in the anterior pituitary. The Growth hormone is often taken by athletes in an bid to gain a competitive advantage over their competitors. increased organ growth e.g muscle mass in the heart (except the brain). D.5 A 2 ​Control of milk secretion by oxytocin and prolactin. Prolactin stimulates the mammary glands to grow and produce milk. During pregnancy high levels of progesterone and estrogen stimulate prolactin production. Breat development takes place but inhibit its effects in terms of milk production. Estrogen and progesterone decline rapidly after birth (placenta has been expelled) and so milk production increases. The milk is stored in small sacs called alveoli. Suckling of the baby, smell and sight of the baby stimulates oxytocin secretion from the posterior pituitary. Oxytocin causes the release of the milk from these alveoli and so can be accessed by the baby. The hypothalamus and pituitary gland. I discuss the two major roles of the hypothalamus: homeostasis and hormones. I also explain how the hypothalamus controls hormone release by manipulating the pituitary gland. I cover the anterior and posterior lobes of the pituitary gland, along with the most common hormones secreted from each lobe. Hank begins teaching you about your endocrine system by explaining how it uses glands to produce hormones. These hormones are either amino-acid based and water soluble, or steroidal and lipid-soluble, and may target many types of cells or just turn on specific ones. The Olympics are upon us, and unfortunately, many athletes use performance enhancing drugs to boost their ability. What exactly does doping and steroids do to your body? Watch the second video in our Breastfeeding Educational Series to answer the question, how will my breast know how much milk to make? Four hormones stimulate milk production and work together to produce breast milk for your baby.